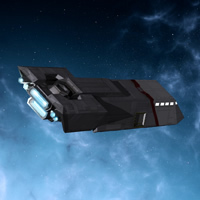 A Javelin class Am-capable high speed cargo transport, the Daedalus is the property of ex-Templar Captain John West. 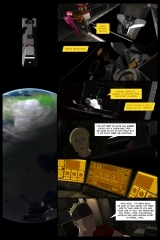 The workhorse of a shady courier service run out of the Australian outback in a nearby pocket universe, the Daedalus is frequently far from Earth, and often under the command of John’s executive officer and co-pilot, Naomi. Designed to haul moderate amounts of cargo incredibly long distances at incredibly high speeds, the Javelin class is equipped with the most efficient engines and non-organic power plant designed to date. 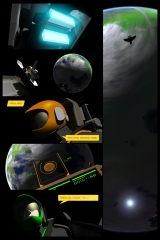 The ship generates artificial gravity by acceleration, and can sustain a 0.5g burn for upwards of six hours. The type is incredibly nimble in a vacuum, though maneuverability in atmosphere is extremely limited. While the advanced RCS system provides a degree of ground effect and the capability to turn on a dime at extremely low speeds, the ship has an atmospheric turning radius of hundreds of kilometers at any significant speed – a maneuverability that decreases exponentially on approach to escape velocity. 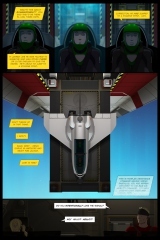 The Daedalus can achieve and sustain escape velocity with a crew of six and a cargo the approximate size and mass of an Abrams main battle tank. 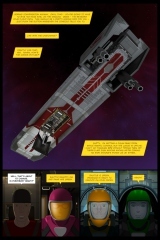 The ship is very lightly armored and is equipped with two aft-facing torpedo tubes and two forward-facing projectile cannon for defense. Crew positions : Pilot/navigator, co-pilot/navigator, flight engineer/weapons officer, communications/electronics officer, two cargo handlers. All crew are seated on the bridge during atmospheric entry/exit. Terran equivalents: Less capacity than a C5 Galaxy though roughly the same size. Bigger than a C-17. Faster than a Sr-71 and handles like a brick in atmosphere. Due to ongoing maintenance issues with the seals in the neighboring Compartment A5, Compartment A4 functions as the primary airlock of the Daedalus. 115 queries in 0.858 seconds.